The entire Making Connections Evaluation team from the USF College of Behavioral and Community Sciences and CFS have committed to walk 60 miles in recognition of the Movember Foundation/Making Connections' focus on men's health. While doing so, they hope to raise $600 dollars for the Foundation, which encourages running or walking 60 miles to recognize the 60 men lost to suicide each hour, every hour. By 2030 the Foundation aims to reduce the rate of male suicides by 25%. Part of their efforts center around the Making Connections Initiative, currently being implemented at 16 sites across the U.S. Making Connections prioritizes those who have particularly high need for community-level attention to improve mental wellbeing, including active and retired armed service members and men and boys of color, and their families. 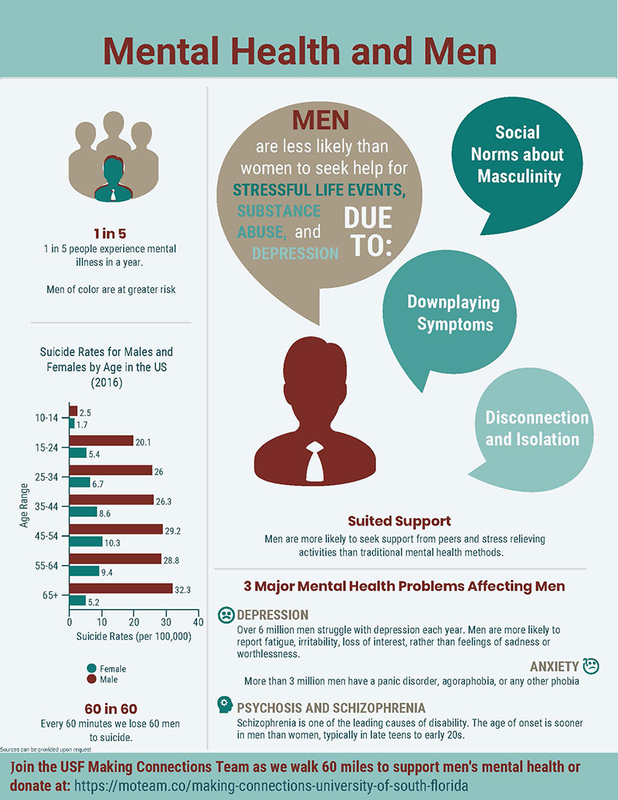 Statistics show that men are less likely than women to seek help for stressful life events, substance abuse and depression. "We encourage everyone in CBCS to join in our efforts to raise awareness about the health crisis facing our fathers, partners, brothers and friends," said Dr. Roxann McNeish, PI of the Making Connections Evaluation. "Funds raised will help to increase awareness about men's mental health and the importance of supporting their mental well-being using gendered and culturally-based approaches." "There is strong evidence that prevention and early intervention can help improve mental health. The Making Connections Initiative connects men and boys in the places where they spend the most time and through activities they enjoy doing," said Dr. Tom Massey, Co-PI of the evaulation. "I encourage everyone to walk with us and contribute to this important cause." Contributions can be made to Making Connections University of South Florida at https://us.movember.com/team/2324177.